Who doesn't like relaxing in a hot bath? 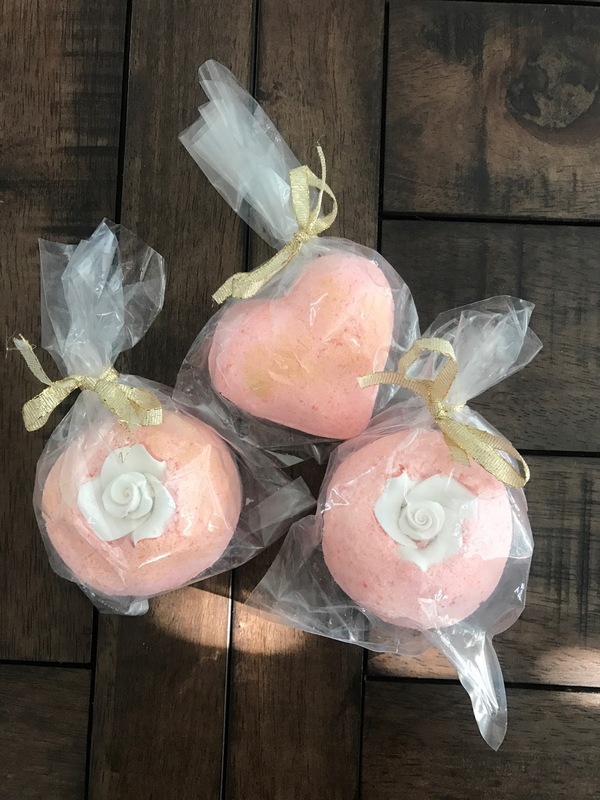 Today I'm sharing about making Bath Bombs. Bath Bombs are all over Pinterest with lots of different recipes, the trick is to find one that works for you. My son's girlfriend wanted to make Bath Bombs for a bachelorette party flavor so the adventure began. The first attempt was a Pinterest fail for us, but the second was a success. Well learned that we didn't make the first batch wet enough to hold together. Being Alabama girls you would think when it say the consistency of wet sand we would know what that looks like! You can use many different ingredients to make Bath Bombs just pick the combo you like best! Mix Baking Soda, Citric Acid and Epsom Salt together in a large bowl. Make sure that the mixture is smooth with no clumps. Melt Coconut Oil in microwave and add slowly to dry ingredients mixing well. Add the Essential Oils of your choice blending into the dry mixture. Add Food Coloring Gel one drop at a time to mixing into mixture until you are satisfied with the color. A little goes a long way. Now spray Witch Hazel few pumps at a time until your mixture is the consistency of wet sand and holds together in your hand. Press the mixture into the molds firmly, over-filling a littlePress the two halves of the mold together until they fit tight and let sit for 5-10 minutes. Carefully remove one side of the mold and let the Bath Bombs dry overnight before removing the other side of the mold. Keep them is a dry place. I recommend letting them sit for a few days before packaging them. My name is Beth. I love all things paper crafting, cooking and diy. I have been married for 30 years. I have two adult sons and three fur babies. I started scrapbooking in the early 80’s. Mid 1990’s I started scrapbooking my families crazy life. Early 2000 I started a business Scrapbooks for You. I did retirement scrapbooks, baby scrapbooks and pre-made scrapbooks that you just add your pictures and journaling to. I also catered weekly meals for my church for a short time. 2005 I started card making, around 2006 I bought my first silhouette portrait machine. I have been using silhouette machines before they had their own software and store. I love to challenge myself to create new files and craft projects. My craftroom is my happy space.